Whilst turning out the garage recently (as you do) I came across a large box of Eldest Child’s books which have been lurking there since he finished at university, came home for a bit and then went off to a flat with a friend. So when he turned up recently I decided it was a Good Time for him to go through the box and see what he could get rid off and what he wanted to keep. Rather depressingly (or wonderfully, depending on how you look at it!) there were quite a number of volumes that I fancied reading and so quite a number were transferred to my shelves, (including a Virago Modern Classic for my collection – “Blow Your House Down” by Pat Barker). Anyway, one of the books was “The Garden Party and other stories” by Katherine Mansfield, another writer whose work I loved but whom I haven’t actually read for years. And heavenali had such a lovely review of “Bliss and other stories” here recently, that I really felt now was the time for a re-read and so spurred on I turned to Eldest Child’s volume, as mine is a little old and brown now! 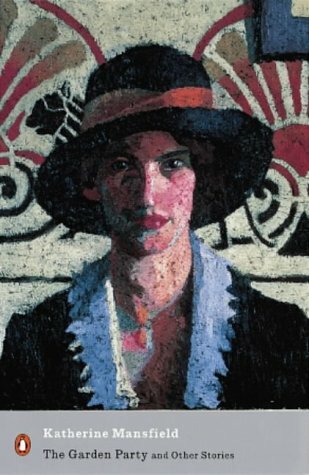 This collection of Katherine Mansfield short stories was the last to be published in her lifetime and gathers 15 stories (plus this volume has a very interesting introduction by Lorna Sage). Of course, Mansfield’s language is quite lovely and you can quite see why Virginia Woolf considered her such a rival! The stories vary in length, from the more involved, atmospheric pieces like “At the Bay”, to the shorter pieces – many of which are no more than poignant vignettes, snapshots of an episode from a character’s life. The short story format was definitely the correct medium for Mansfield – she has the skill to capture all she needs to convey about a person or place with few words, and this economy of style is never boring. The locations vary from New Zealand to the south of France to London, and wherever they are set, most have an underlying sense of sadness. I think that when I first read Katherine Mansfield I didn’t quite appreciate how much her stories reflected the situation of women in the early part of the twentieth century, the constriction of their lives and their lack of choice. In “At the Bay” the whole household of women relaxes when Mr. Burnell leaves for work; spinsters like Miss Brill fill their lives with play acting to convince themselves they are alive with a purpose; the “Daughers of the late Colonel” have been expected to sacrifice their lives to taking care of him and so on his death are, mouse-like, unable to take action about anything – life and love having passed them by; in “Mr. and Mrs. Dove” (which made me think of Virginia Woolf’s “Lappin and Lapinova”), despite Anne finding Reggie funny and feeling only friendship for him, she will most likely marry him rather than risk remaining single. Not all the stories are so direct – some, like “The First Ball” deal with a potential loss of innocence, and how cynicism can be overcome by youthful joy. Others, like “Marriage a la Mode” and “The Stranger” deal with male jealousy as women start to spread their wings, dissatisfied with their lot or unwilling to completely surrender their whole being to their partner. There is a sense that so many of these women are vulnerable, living their life on a knife-edge and totally dependant on the whims of their men (“The Music Lesson”) – it takes very little to spoil their day, or their way of life (the young people laughing at Miss Brill’s fur). But Mansfield does not only write of the well-to-do or would-be upwardly mobile. She has a very astute awareness of class differences – most noticeably in “The Garden Party”, when the sudden death of a labourer threatens the gilded cage of the Sheridans. More pointed is “Life of Ma Parker”, where Mansfield mocks the literary gentleman who has no idea of real life and grief. These stories pack a punch. I loved reading these stories again, and actually found so much more in them that at first glance – maybe they need the perspective of age, or perhaps just a second reading, but Mansfield was a truly great writer and it’s a tragedy she died so young.